The cyclical aftermath of the nation’s mass shooting has repeated itself several times during Trump’s year-old presidency, including with the deadliest mass shooting in modern U.S. history when 52 people were killed on the Las Vegas strip last October, and when 32 people were killed at a church service in Sutherland Springs, Texas, in November. In both instances, Democrats called for a major push for gun control, and even some Republicans said modest changes to the nation’s gun laws might be in order. Students and parents of those killed at Stoneman Douglas High School, even the conservative New York Post, have asked the president directly to take action on gun control. 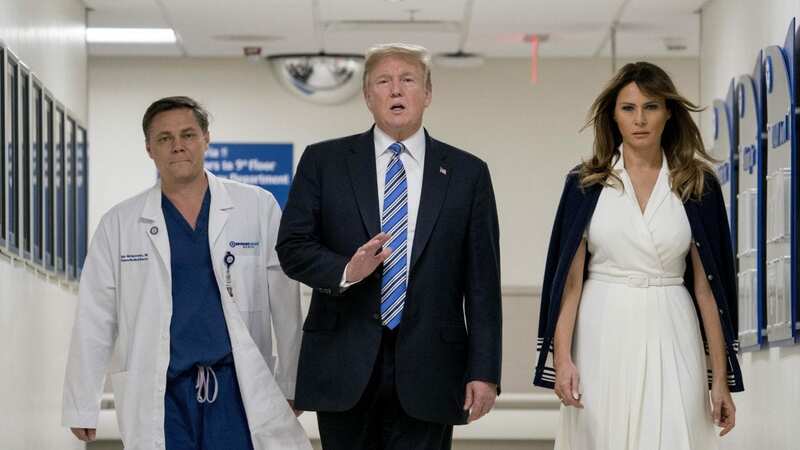 He didn’t mention the word “gun” in an address to the nation the morning after the shooting and ignored questions from reporters about acting on guns when he visited the injured in Broward County, Fla., on Friday evening. The president did take time on Sunday to criticize the FBI for failing to act on a lead about the alleged gunman, 19-year-old Nikolas Cruz, who police say has admitted to conducting the armed rampage with a legally purchased AR-15 rifle. Trump said the bureau has been spending too much time on the Russia probe, an apparently unrelated issue to the failure to pass the tip on Cruz to the FBI’s Miami field office. Survivors of the shooting and friends of victims reacted sadly and angrily to Trump’s tweet. In addition to holding a rally and speaking out in news interviews and on social media since last week’s shooting, students are organizing a nationwide walkout of students as a call to action on April 20, the 19th anniversary of the massacre at Columbine High School in Littleton, Colo. The mother of a 14-year-old murdered at the Parkland school went on CNN and spoke directly to the camera, making an impassioned plea to Trump by name, asking him to “do something” to keep guns away from those who would carry out school shootings. On Thursday, Trump will meet “with state and local officials on school safety.” The next morning, the president will address the Conservative Political Action Conference, a group for which gun rights are a top issue. Wayne LaPierre, one of the leaders of the NRA, is also scheduled to speak. After the November shooting in Sutherland Springs, Texas, it was discovered that records of the shooter’s Air Force court-martial conviction for domestic violence were not properly entered into the national background-check system for gun purchases, and if they had, he would not have been able to legally obtain a gun. Changes to the background-check system were supported by the NRA, as well as Sen. John Cornyn of Texas, the No. 2 Republican in the Senate, who introduced a bill with Democrat Chris Murphy of Connecticut, who became one of the most visible advocates for gun control after the 2012 shooting in Newtown, Conn. Asked about the lack of action on NBC’s Meet the Press Sunday, Sen. James Lankford, R-Okla., said there may be measures that could be put in place to make it harder to get a gun for someone with the behavioral warning signs people saw in Cruz. He also noted, though, the high bar to limiting gun ownership due to the Second Amendment. Rep. Ted Deutch, D-Fla., who represents the area where last week’s shooting took place, told ABC’s This Week on Sunday that he’s hopeful the activism of the students at Stoneman Douglas will move the debate forward.